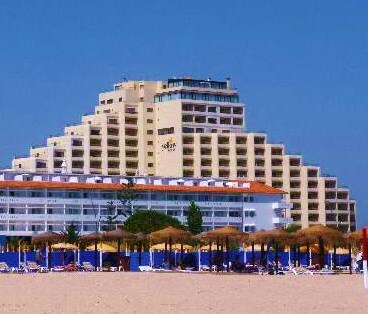 This is the big beach resort.This is Algarve summer holiday.Big and boisterous.Think your favourite beach resort uk.Add gleaming white sand and wall to wall sunshine.Get the picture! Please click here.When you wish to go back to the main Algarve Information Index. 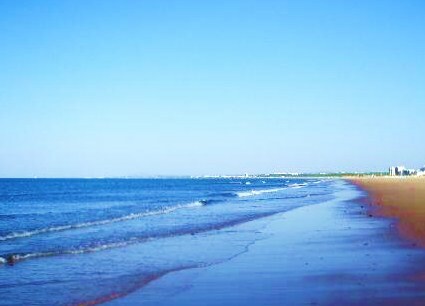 MonteGordo.to me this has to be one of the best and most magical beach resorts on the Algarve.If you like the traditional beach resort then this is the place for you. It has a massive golden sandy beach with a great many hotels and restaurants.Many coming right onto the beach itself.There are many hotels both large and small,so there is bound to be one to suit your tastes.Restaurants abound and there is cuisine to suit all tastes and budgets. Nightlife should be good enough for most, catering for all age groups.It has that exciting neon lit atmosphere which is so necessary for the beach tourist. iT is situated on the Eastern Algarve coast;known locally as the" Coast of light".The light and the air has a very special feel and once travelers have experienced it they tend to keep coming back.It is as exotic as anywhere on earth. 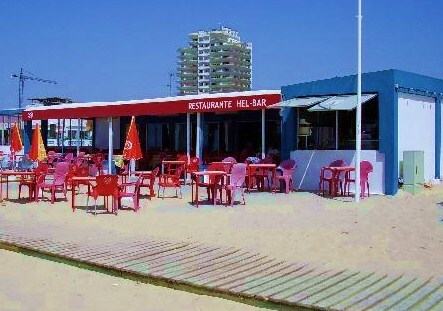 Above is one of the many Beach Restaurants at MonteGordo,which make the place so special.Here you can sit and dine on fish caught that very day.What an experience that is.It is impossible not to relax and enjoy yourself.The flavour of fish this fresh is one of life's great treasures.You can understand why once experienced; tourists have to keep coming back. The location in my humble opinion cannot be bettered.The Spanish border is only minutes away.You can take a must do trip to Seville,one of the most beautiful and vibrant cities in the world.Two hours on a coach trip you can be in Lisbon Portugals wonderful and historic capital.Another place to visit before you die.Morocco is just a short ferry ride across the mediteranean sea.This is usually a two day trip,so to give you time to appreciate the place. This is just a very brief list of places you can visit form here.The wonderful city of Tavira is just twenty minutes away and if you are feeling energetic one can actually walk along the coast to Vila Real St Antonio another vibrant must see Portuguese town. 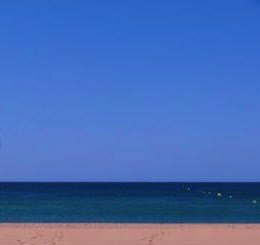 Where else on earth can you have so many exciting and famous places you can visit.The location is second to none.You can rent one of our luxurious apartments fifteen minutes away by wonderful Cabanas and get the train to Montegordo! MonteGordo being a larger beach resort benefits from extra tourist help.In this vein there is a usefull company that supplies just about everything visitors need in one shop. Tur Animacao Turistica Lda can help you organise many activities.If you like to explore on bicycle then you can hire one for as little as 5 euros per day. You can book many excursions to places around the Algarve or trips into Spain.Seville is a must do trip! How about booking a trip to Zoomarine? To see the Dolphins and lots more.The seal show and pirates is great fun. Book to go and play and splash and ride at Aqualand Water Park.Tur Animacao do most of these at discounted prices. Also in their repetoir are boat trips,coastal cruises,inland and nature reserve Safaris. 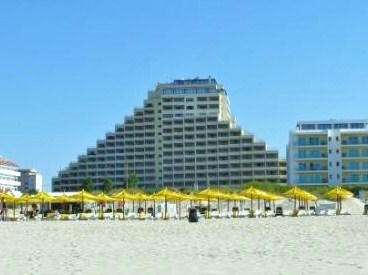 On the usefull side they can arrange your car hire needs,airport transfers and private transfers around the Algarve. All in all a very usefull company to have working on your behalf. The Casino in MontGordo was opened in 1996 giving a little adult entertainment in the resort.I know a lot of people on beach resort holidays enjoy a little flutter and what is wrong with that.Just as long as you do not have an addictive personality and know when to stop. Gives a little of the Vegas flavour to the resort,it offers a modern gaming room (of course!) with over 200 slot machines.For more entertainment there is a nightly floorshow along with food and drinks. Want To Stay ten minutes walk from Cabanas de Tavira in The East Algarve and our 1 bedroom apartment Superb One Bedroom Apartment,East Algarve nicely situated both geographically and by being 2 minutes walk from a picturesque train station.The train is so cheap to use and Monte-Gordo is a short walk from the station.Another top popular beach close by is Manta Rota.You cannot go wrong in this area.You will never be short of places to visit.